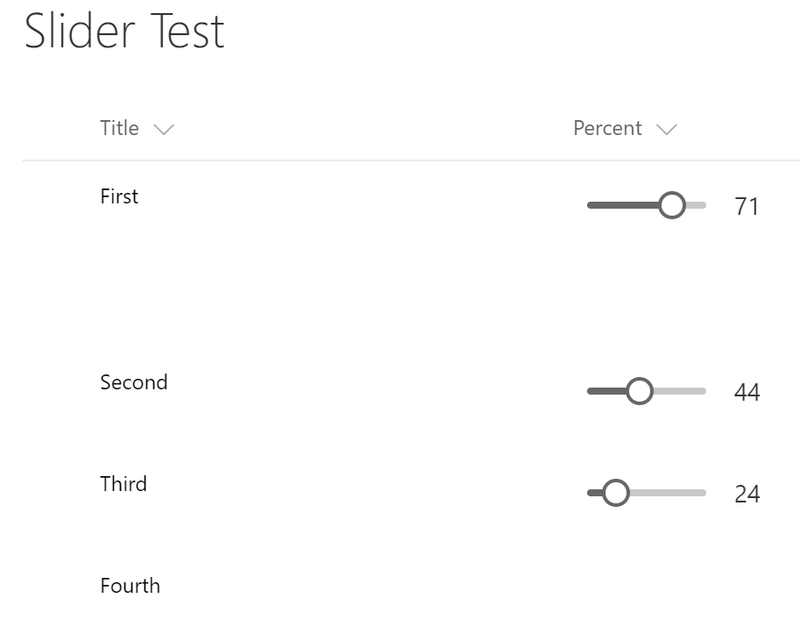 In this post I want to show you step-by-step implementation of SharePoint Framework Field Customizer - React Slider Customizer. UPDATE: on 9/25/2017 SPFx Extensions were GA-ed. The post is updated to contain the latest version of API. For those who doesn't want to read the post but need the code - you can get it from here. Get Office Developer Tenant (you can get one for free by subscribing to Office 365 Developer Program. It's an optional step as Extensions reached General Availability but it's good to have the tenant to be able to get preview versions in future. First step in any SPFx project is to "scaffold" it using Yeoman SharePoint Generator. "Scaffold" in more classic terms means generate or create from a template. Here are the steps to create a project. Congratulations! The project has been scaffolded! Now you can open the project in favorite IDE. 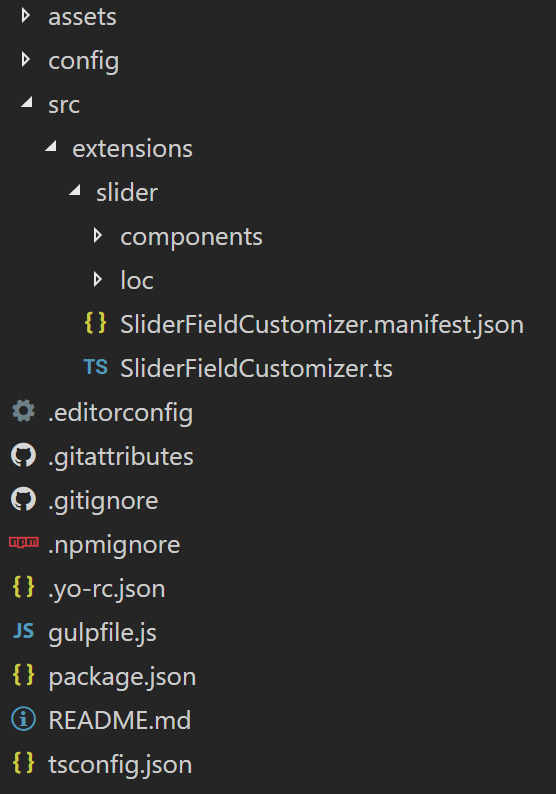 Note: this is a TypeScript project so select the IDE that supports TypeScript language. I'm using Visual Studio Code. I decided to put this section at the beginning so you could run the code each time you want to check if everything works fine. --nobrowser parameter tells to start the server but do not open workbench page in the browser. If the code compiled without errors the server will be running on http://localhost:4321.
loadSPFX=true ensures that the SharePoint Framework is loaded on the page. For performance reasons, the framework is not normally loaded unless at least one extension is registered. Since no components are registered yet, we must explicitly load the framework. 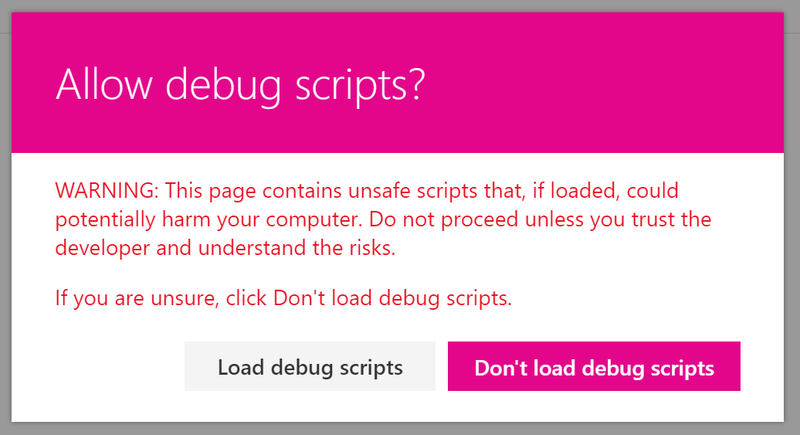 debugManifestsFile=<URL> specifies that we want to load SPFx components that are being locally served. 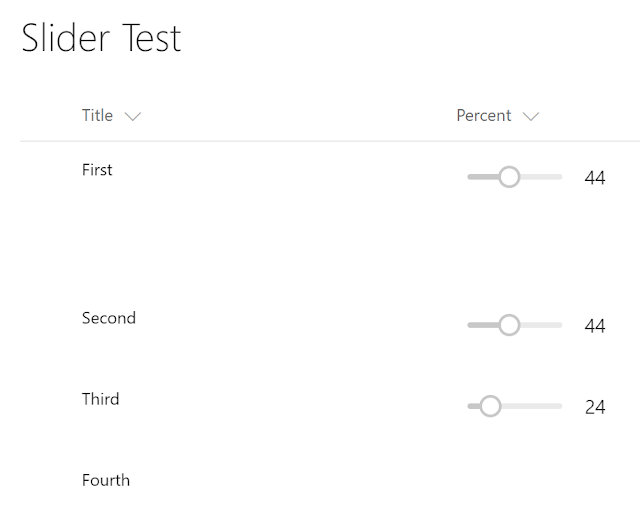 Normally the loader only looks for components in the App Catalog (for your deployed solution) and the SharePoint manifest server (for the system libraries). 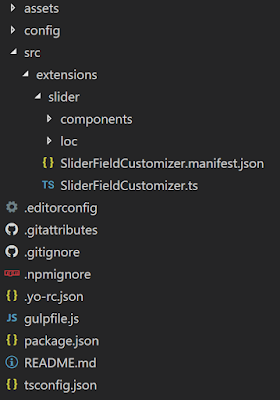 fieldCustomizers indicates which fields in your list should have their rendering controlled by the Field Customizer. The ID parameter specifies the GUID of the extension that should be used to control the rendering of the field - ID value is located in manifest.json file of the extension. The properties parameter is an optional text string containing a JSON object that will be deserialized into this.properties for your extension (in current example properties parameter is not set). Next step is to add external libraries (modules) that will be used in the project. For this sample the libraries are Office UI Fabric React and SharePoint PnP JS Core Library. Office UI Fabric is included automatically because React framework was selected as a basement of the extensions. In Command Prompt (Terminal) go to project directory. onRenderCell method is an entry point for actual rendering. You have access to cell's div to render your content. Also, there is a bunch of helpful objects inside this.properties property and event object (such as field value, field information, List View properties, etc.). 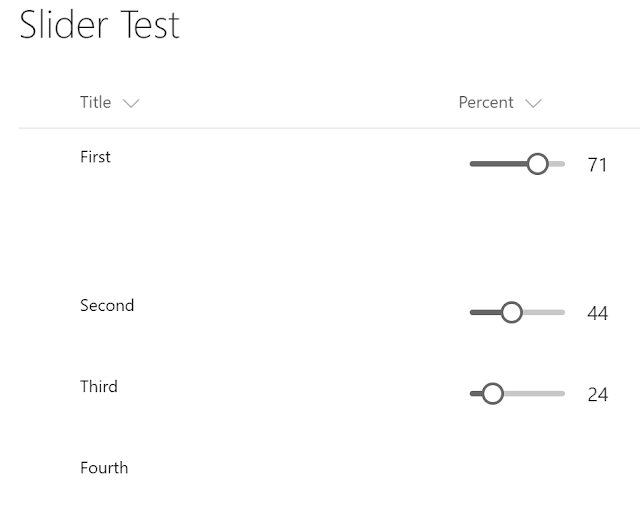 Let's change the Slider.tsx to display a Office UI Fabric Slider control. (named import is used as the control itself has name Slider). Now let's render the slider control in onRender method based on the parameters from Props and State (I've hardcoded min value to 0 and max value to 100 to simplify the example. In real world these values should be changed based on business logic). Let's return to SliderFieldCustomizer class and modify it to pass correct props to Slider control and to handle value changes. Add onSliderValueChanged empty method to use it as a value change handler (we'll add the code later). The last part of the implementation is to save values' changes to the back-end using PnP JS Core Library. 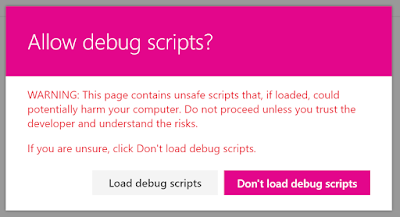 This code will work but it has one major flaw: update request will be sent each time a user drags the slider. It might lead to multiple requests per second. It's much better to wait until a user stops interaction with the slider and send single request with the latest value. Let's use window.setTimeout to implement such logic. Now the request will be sent 1 second after last value change. That's it! 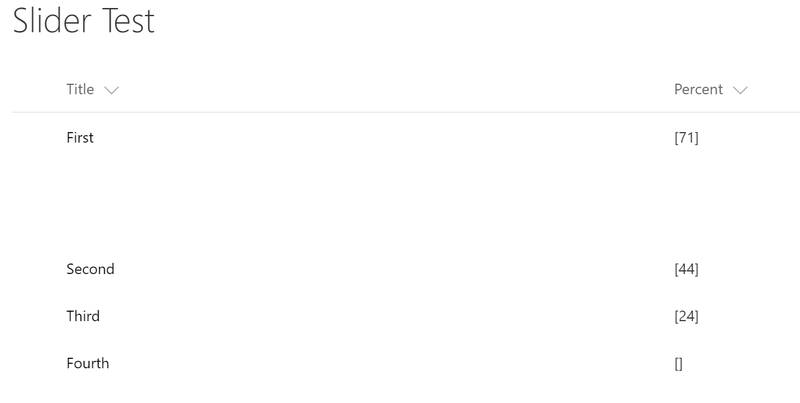 You can get the code from GitHub repo.